1. Forging a future on Homelands. Small township parents and grandparents are determined to do whatever they can to find a future for their children and grand children. They do not see that they can do this if they leave their ancestral estates. Follow this link to Arnhem Weavers. The Arnhem Weavers website was set up and is maintained with funds from School Fonts. 2. Establishing schools for Yolŋu children in Yolŋu Land (east Arnhem Land), NT. Of the fifty or so small townships in Yolŋu Land, in 2016 only three have schools. One is a government school, and two are independent schools under the umbrella of NT Christian Schools. Governments are not intending to offer small township residents access to local schools or distance schooling. Since 2014 Schools Fonts has been funding discussions with all stake-holders and the establishment of a local steering committee to oversee the project. For more information about the lack of schooling opportunity in the NT you can read two case studies on the Institute for Cultural Survival Inc website. 3. Producing resources in Australian languages. Schools Fonts funds the development and printing of resources in Yolŋu languages through the registered charity Institute for Cultural Survival Inc. The publications are intended to promote the learning of Australian languages by Australians and others around the world. Further information about these publications is available through the Yolŋu Studies website. 4. Opportunities for young adults in Homelands. Many youth and young people in homelands are keen to develop their skills and knowledge in Western environment by temporarily leaving their country. When they leave they do so with the full support and encouragement of their relatives and families. The youth and their families are proving that homelands are not only sustainable, but for them the only way forward. This project is one way that seems to be heading in the right direction. Merrill grew up at Mirrŋatja and Donydji in Yolŋu Land (east Arnhem Land). There was no school available for Merrill to attend until he was 16 years old. In 2002 a teacher at the school on Elcho Island organised for a group of young homeland men and women to stay with him inorder to gain their car licences. During their stay Merrill asked the teacher to help him find a way to develop his mechanical skills. Merrill proved his determination to develop his skills by actively participating in all VTE training offered to him. But unfortunately VTE training rarely leads to real jobs. Merrill was keen to leave his home and attend a secondary school, but this would not have been a positive move. The most viable option was for Merrill find a billet and work place where Merrill could develop his skills in a supportive environment. After three years of negotiation MAF (Missionary Aviation Fellowship) agreed to take Merrill for ten weeks work experience. School fonts agreed to paid a contribution towards the wages for Merrill's supervising engineer. 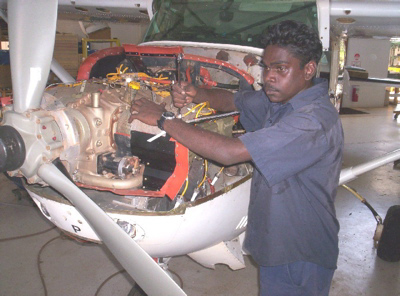 So in 2005 Merrill spent ten weeks work experience with MAF at Mareeba, Queensland. During this time he showed exceptional character, determination, talent and skill. During the ten weeks he billeted with families his English proficiency progressed the equivalent to 3 years fulltime schooling. Jonathon Brown of MAF, Merrill's supervising engineer said. "I can confidently say that Merrill has the ability and attitude to become a commercial pilot within two years, he just needs to right circumstances." 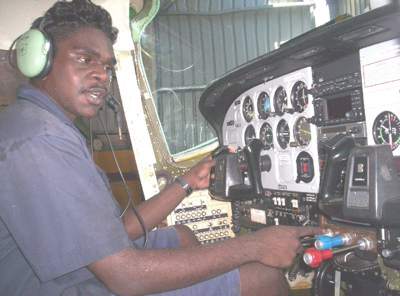 An application was written to NT DEET (NT Department of Employment, Education and Training), fortunately and thank fully they agreed to fund Merrill's accommodation, toolbox, computer and flight simulation software. Merrill is now back with MAF in Mareeba and has gone for his first flight. Read an article from the MAF. Some people may ask. "How can a person who has never been to school even think about going for his pilots licence?" A more appropriate question is; "What makes it possible for a young man who doesn't speak English and has never been to school have so much confidence in himself, that he can take on such a project?" It is because he grew up with loving, caring, but very straight, no fuss parents and grandparents living on his ancestral country at Mirrŋatja that made it possible. In fact one relative said, "it is because he didn't leave his country to go to school in the town, that he is able to achieve these things." He has a very strong sense dignity and pride in being a Yolŋu man. (Yolŋu is what the First Australians from Yolŋu Land call themselves). At Mirrŋatja Merrill is no exception, all the youth are equally focused and determined to forge a future for themselves and their families. They are fully supported by families to take these steps because together they are proving that homelands are sustainable. Mirrngatja School was built and funded by the Mirrngatja families in 1982. In 2007 still no toilets, computers, or any of the equipment found in other schools around Australia. The average annual attendance is usually close to, if not 100%.